What do you get when you cross a brownie and a muffin? Double chocolate goodness. Here, however, it’s quadrupled because there are four kinds of chocolate in the batter: unsweetened, bittersweet, cocoa powder, and chips. These perfect, thick rounds, baked in muffin tins, behave a little like cookies, but their softer centers, loaded with chocolate chips and walnuts, resemble brownies. 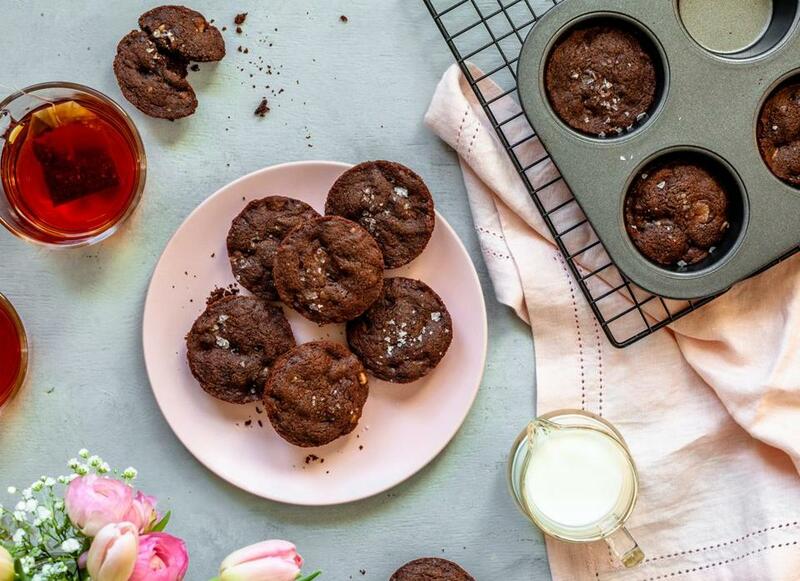 The irresistible little rounds have the ultimate chocolate topping — a sprinkle of flaky sea salt. 1. Set the oven at 350 degrees. Butter the cups of two 12-cup muffin tins. 2. In a heatproof bowl over a pot of simmering water, melt the unsweetened chocolate and bittersweet chocolate. Remove from the heat, wipe the bottom of the bowl dry, and set aside to cool slightly. 3. In another bowl, whisk the flour, cocoa powder, baking soda, and salt to blend them. 4. In an electric mixer on medium speed with the paddle attachment, if you have one, or the beaters, beat the butter with the granulated and brown sugar until creamy. Add the eggs, one at a time, mixing until they are incorporated. 5. With the mixer set on low speed, gradually add the flour mixture and mix until blended. Add the melted chocolate and mix until it is incorporated. Remove the bowl from the mixer stand and stir in the chocolate chips and walnuts. 6. Have on hand a cup of water. Spoon a rounded tablespoon of batter into each muffin cup. If you like, use a small cookie scoop that holds 4 teaspoons to measure the batter, dipping it in water every so often to keep the batter from sticking to the scoop. 7. Wet your fingertips and press the dough into each muffin cup so it conforms to the bottom of the cups. Sprinkle each one with a pinch of flaky sea salt. Sally Pasley Vargas can be reached at sally.p.vargas@gmail.com.